Just remove all rocks and you can move em with 5cm of water. Your reverse cycle is going to provide some air blowing on the tanks??? Cheers, will remove as many rocks as I can, need to take "final" photos of my 45p and 60p before I move them as I dont think they will look to good after the move and when direct sunlight starts hitting them! I am going to set up some shade cloth to filter some of the morning sun which they will cop until about 10 - 11am. Yes the reverse cycle blow directly on the bottom tank, not much I can do here, this is the only logical location for the tanks, the current 2ft has done fine, the AC does blow out hot air when run on hot days but the plants, fish and shrimp have gone ok when the water rises to 32 on hot hot days. When using the AC on not so hot days and in winter it blows cooler air, water evaporation out there is very high, need to top that 2ft up daily. I wont subject my 4 otos from the 60p to the heat, they will go in the 3ft bookshelf along with the 2 surviving CRS (if they are still alive). Probably have to give away the Embers, the yellow mountain minnows wont have any issue with the outdoor temps. Last edited by doylecolmdoyle; 10-02-18 at 10:51 PM. Managed to move the 400kg Rack-It "rack" into place yesterday, had to move the current 2ft outdoor tank off the old wire rack and onto the rack-it rack... was fairly heavy with about 5cm of water and a few rocks but I managed, I would guess it weighed about 20kg with just the small amount of water in it, the 400kg (per shelve) rack it seems to be holding the 2ft tank with no problems, no sign of the shelves / cross beams bending under the weight, next job is to move my 60p and 45p from my study out to the balcony / outdoor rack. I need to sort out wiring (want to keep things clean and safe) I have 2x outdoor power-board cases and have lined the rack with waterproof shade cloth, it will not be water tight but the old setup was fine out there all of last winter. Could probably custom model you some supports for the lights to clip on the edges of the shelf maybe? Depending on the type of light you have it might be fine drilling into your plywood (just dont go the full 9mm... ). THe MML lights are quite light so wouldnt have issues being held in just slightly IMO. 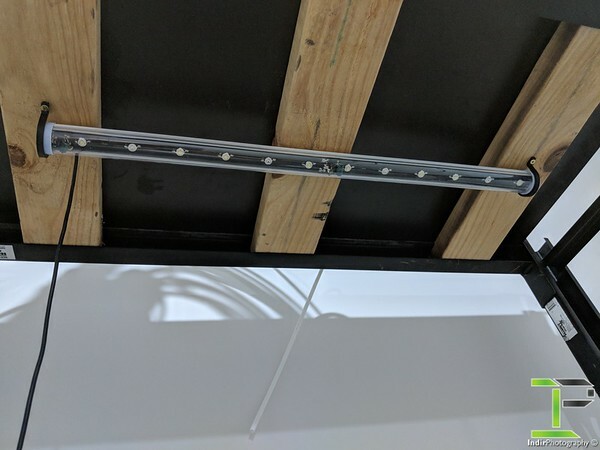 Other option is to glue some extra plywood bits under the shelf and mount light to this? Just small pieces would be fine, glued/drilled into the plywood shelf and you'd be able to mount to this quite easily and have 2x9mm plywood pieces to drill into. If you've already got weight on the racks ie tanks, then just 'build' your mount with more plywood and attach the lights; then glue them on. Maybe design a quickmount system if you envisage having to take them out. Cheers no weight on the upper shelves yet so easy to add the extra bits of wood to the underside! Need to get a ply sheet cut for the very top shelve, this level will just be used for storage, the wire shelve is just temporary. I think I will just use cable ties to attach the lights, if I need to remove the lights I can just cut them out and replace cable ties as needed. Here are some snaps I took before reading the advice. 60p will go on the middle shelve and 45p on the top, have a spare little filter so will probably get a smaller tank to sit next to the 45p and keep it going as a quarantine tank. Have got a 4 way splitter for my co2, the 45p and 60p both had atomizers attached to the filters (all run the same ISTA mini canisters) I will probably add an inline atomizer to the bottom tank and do away with the diffuser, tho it works very well with the eheim pump thing above it. Last edited by doylecolmdoyle; 19-02-18 at 08:06 PM. Well the shade cloth cover failed last night, it gets pretty windy here and the full length flap of shade cloth was whipping around in the wind, going crazy, I could see the possibility broom handle I used at the bottom of the shade cloth (for a bit of weight and to be able to roll it up easily) being flipped around in the wind and smashing the tank, removed the shade cloth from the front, going to cut smaller individual panels for each level and maybe cut a slit or something down the middle so the wind can escape without trying to pull the shade cloth off. Maybe try a shade cloth that is semi opaque will tiny weaves in it? Yah, that stuff would be better and cheaper, I got the waterproof stuff, has a plastic backing and the wind cant get thru it, didn't think of the wind at the time, basically like a big sail flapping around on my balcony, will see If I can make the smaller panels work, cost me about $20 a mtr so would like to make this work before buying more stuff for the rack, I did think about going back to what I was doing with the old rack, cutting thin ply to size, again trying not to spend any more cash! Hmm... Maybe you need to think about water proofing in general; also for the ply. Otherwise could be a little tricky if rain gets in. yeah rain gets in a bit, nothing to serious tho, the old rack had ply shelve and it was fine, I painted the ply which will help a little, couldn't get form ply in 9mm, tho no real reason i couldn't use thicker sheets just wouldn't sit flush with the cross rail, Form ply was first choice but Bunnings here wont cut the form ply, not sure why but they flat out refuse to which is annoying... saying that I use to work at Bunnings years ago while studying and back then we where even told not to cut form / film faced ply for customers. Maybe a waterproof paint layer to make it more durable? I wonder whether the foam ply has some fumes/particles which could be ejected and inhaled or something making it a liability for B*mob? Maybe in combo with windholes like on big public banners. (U-shaped cuts). Should be ok with the acrylic paint I have used, the glue used in the ply is external grade i.e sheets wont seperate but the wood could rot if left wet for to long, any rain the rack gets is just overspray / light spray and dry fairly quick. You can get reusable zip ties, or similar easy to undo by hand ties to hold your sheet down without being ripped up. Something like velcro strap, slide it through a hole and through the rack to hook it up, velcro wont undo in the wind but is easy to undo by hand. But cut the wind holes in or something, the wind could possibly topple the rack if it cant get through the cloth and the cloth is tied down hard enough? Not sure if that would happen but i wouldnt want to risk it haha.